I did not win. Shocking I know, but I wasn't expecting too much. These things take a lot of work and I just didn't have it in me. Having returned safely to BC I've vowed to go all out for the next one. The Chaos Codex is coming out soon and I've already had a peak and I've got some mad schemes. First since I can't seem to harm a Land Raider I'm painting one up and including it in my army for most games. I also think it will be hard to pass the new Chaos ordnance sporting vehicle, and even though they occasionally shoot your general in the back, I was satisfied with my dreads, so my next army will also have three Heavy Support choices. I also am looking forward to the two wound independent character and the larger squads. Fourteen man squads here I come, you really didn't think I had enough painted plague marines did you? I also want to spruce up my older models more or just paint new snazzy ones to replace them, which is GW's ultimate aim anyway. Although I had to leave before seeing my score, I know who won. It was the 5th Chapter of the Ultramarines. He was fond of voluntarily falling back which some I talked to, found dubious. Most players weren't there to win and some didn't know all the rules like me. I think I could do better in painting and wins next time and hopefully raise my overall score. I still am curious to know how my seven, seven man squads army was judged. The tournaments can be quite different from year to year and venue to venue so take my thoughts with a grain of salt. I recommend making a display for you army to generate buzz. Buzz is very important, without buzz you will not do as well as you could. Judging can be very subjective, there was some dispute of the painting scores for instance. 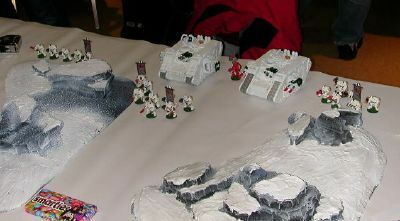 I haven't seen them, nor did I get a good look at the winning army, it did not have a display so you could say it violates my buzz theory but you weren't there it did have buzz, and the overall winner's army had a display. I put all my pictures that were decent up here. Some of those photos will be interspersed with my thoughts and comments on my six games below. I highly recommend going if you can, it was totally worth it, the hotel treated us great, free food, free refreshments, no grief at all from the hotel. Watch out for extreme armies though some things you just can't plan for. I hope I got all my opponents names right. It was early, I had very little sleep, he had 190 orknoids, I had to advance into buildings, get out of my rhinos and hold mission objectives. It did not go well. I only got four turns, this annoyed my opponent who wanted to "massacre me" but as I told him at the time, "I was dying as fast as I could." He wasn't a horrible guy, but that mission, his army, on that board was not pretty. So I lost and started the tournament in a hole. 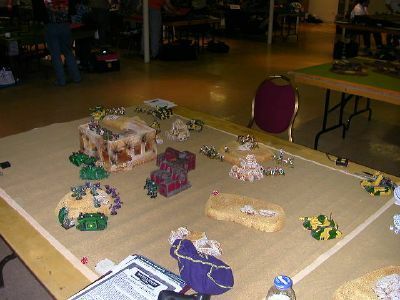 I did not play smart and had to spread out my force and fight a lot of battles against overwhelming numbers. With the city fight rules which didn't fully sink in, along with the Waarrgghhh which also didn't sink in until I watched how many dice he was rolling, it started off bad. Slim and the Deamons push past the objectives won a round of H2H only to get swamped with over 90 to hit rolls the next turn. I should have retreated faster once I had the three objectives. I sent one rhino to each objective. I let him open his first to see if he got the sabotaged one. I thought you had to hold the objectives, he used his huge squads to shift his objectives to inside his deployment zone before you could blink. I just let him do everything he wanted cause he seemed to know what he was doing, the buildings were not helping and forgetting to move my dreads on the first turn meant no orks died for two turns. 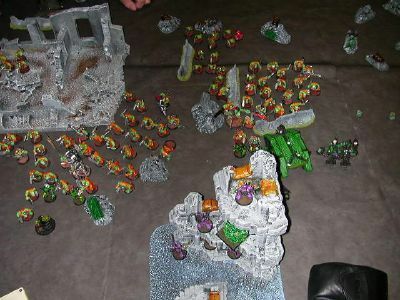 You can't kill 190 orks in two turns, especially when they charge you. I would get my revenge on the orks in the cities no less. But as time ran out, my Plague Marines took all the ork hits and still hung on to deny the massacre. George appeared in the back on the second floor, note to self, put all champs on the ground floor. This picture was just before the end, I think George got into H2H on my last turn. The Swiss system threw me a bone but I didn't take enough advantage of it. 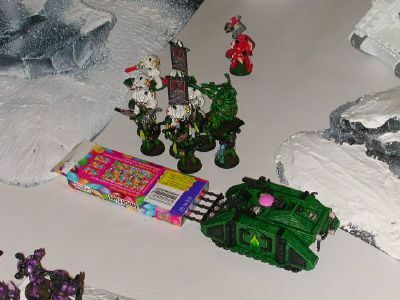 He had a land raider which I couldn't kill, and I also spent a lot of time fighting his commander in H2H with my rank and file and shooting at his terminators. I wasted George and an entire squad hiding behind a hill cause I thought I would end up with that quarter for sure. He was very keen on measuring the quarters and not so quick on playing the game. I think we got in four turns which hurt as with the exception of his landraider I was rolling over everything once I got Slim and the Beast Rabaan in H2H. Oh well it was my fault for not being smart and shooting at something until it could no longer claim table quarters then moving on to a new target. I learned that lesson which I hope to apply in future tournament games. Game three against Simon Duggan's Deathwing. I had two large ice covered hills between me and the all important smarty box. I sent the Rhinos and one dread around and sent all the foot sloggers, Slim and the Beast Rabaan over the top. It took four turns to run the foot sloggers over. One rhino escaped the incoming fire of the two landraiders to get to the smarty box. Before this game started they changed how it would be scored literally every five minutes. My rhino grabbed a lone smarty but the squad inside went right past to engage the enemy. This proved smart as the enemy could never get out of H2H as I kept bringing in reinforcements when I could. The H2H melee also restricted the firing lanes of the landraiders some. As you can see George ended up in the right place for once. There was some confusion on the order I rolled for each champ, so I did it over and George ended up in the exact same spot. Between him, Slim, the Plague Marines, and the Neatherworldly Mathematicians I cleaned up in the middle. His flanking terminators were not fast enough, the landraiders though fearsome would have only been able to seize one smarty apiece. 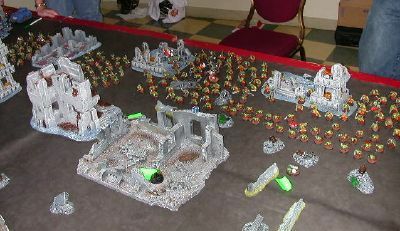 This mission favored armies with a large number of models. I got six turns and just scooped up the smarties at the end. It turned into a massacre even though he had plenty of troops left, the smarties were all. Another Day, Another City Fight? We were suppose to fight in the city, but Duncan Gilchrist had fought all his games so far in the city, even once on the very table we were assigned to. We ended up in the dessert. I planned to be the defender, so did Duncan, but I had more points of Heavy Support. All I can say is despite a vicious barrage from the battle cannons to open the game, and some close moments between Slim and his command squad, my plan worked. He had a lot of troops but I couldn't believe how easy they died. Low armor and toughness three, my Plague Marines never had it so good before. I even got to stand still and rapid fire. It wasn't all easy pickings, I had to charge across the barren desert to try to get to grips with the Leman Russ on the right. The one on the left and the Hellhound were equally problematic. Eventually he and I ended up in H2H, he needed to get into my deployment zone and I'd vowed to assault anything which crossed the line. At the end all he had was a Basilisk. I ended up with a huge score and my second massacre in a row. We made some slight mistakes with rallying. I always let him try to rally but he should not have been able to even attempt to at below 50%. I forget those rules as I'm fearless. Another rule which I have never, ever, ever taken advantage of is Slim's wings when pursuing a running enemy. Should he get three dice? No matter they've changed the H2H rules and I plan to build a new general for the new codex. Have you seen the two Nurgle deamon weapons? D6 extra attacks is going to be hard to pass up. Plague Marines will be more expensive I think, 20 points, Plaguebearers too so I will have even fewer models especially with my dream of lots of Heavy Support. Not you, you're the Loudest Guy Here! That is what I said to Steve Mansfield when I saw he was my opponent. He was a good guy. Had a nice sisters army. And I think it pays to be loud and memorable at a GT. Paul Sawyer during the Q&A session knew his first and last name. And he was remembered for the "best opponent of the tournament" frequently too. I awarded him my bonus points. Through the power of Google I found his summation of this game on a yahoo group. You got to scroll down a lot to get to it. It's a mammoth post. 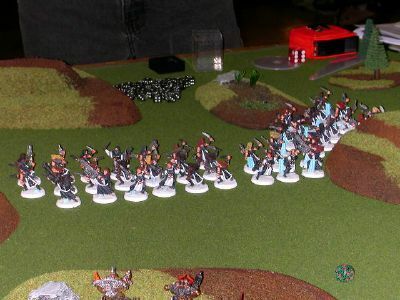 As for the game, I was initially outnumbered 60 (30?) to 14 I think. It took a long time to kill all those little girls. But I did it. Slim's Nurgle's Rot worked like a charm. My dreads repeatedly went fire frenzy and ended up taking a lot of incoming fire. The big sisters squads had enough special guys, mealta gunners, eviscerators, champs etc. that they was hard. But wiping them out left me in the lead with victory points as my squads are all cheap and only one (Diahoreah) was completely wiped out. 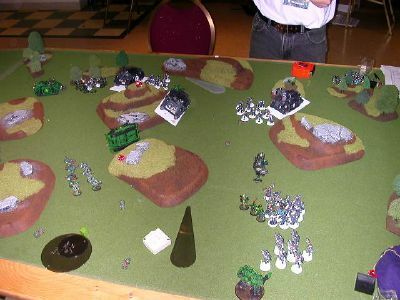 The game came down to two desperate fights for the two non-deployment quarters. We both wanted to be in H2H so it was nice for both of us. He failed some break tests on the last turn, but I killed my own general the turn before. Although there was much confusion but we ended up with a draw. We even had to officially change his score as there was some debate whether my damaged but mobile dread could contest a quarter edge. This was the closest game and therefore the best. We also finished early for the only time of the tournament, he had a lot of models too, but since most of your army starts on the bench I think this mission plays faster. These last photos were taken just before my last turn I think. Lets just say, I'm not stupid I learned my lesson. 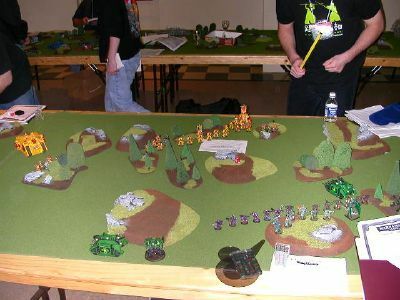 This was a different Ork army with more variety including some trucks and some killer kans, even a looted Griffon. He had the city fight rules and our game took a while for a variety of reasons. Todd Thorhauer is a big guy. I'm not talking about girth either. 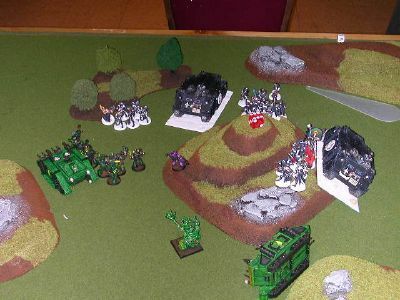 My basic tactic was to advance and harry him with my rhino's storm bolters and firing from hatches and charge him on my terms, picking which units I charged carefully trying to avoid counter charges. I avoided the Warboss as best I could knowing that the bigger the ork, the 'arder they are. 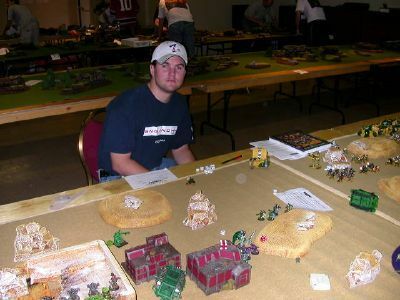 I fought tank busters and grots early. 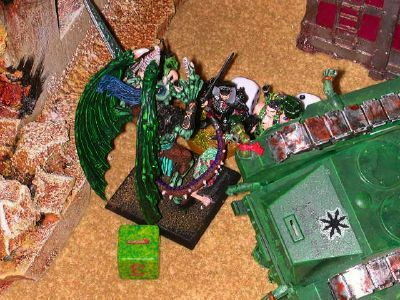 I also wiped out the Kommandos. He got in my deployment zone but my dread was almost unhurtable by his truck boys. My squad couldn't hurt his killer kans much. We both forgot about voluntary fallback. Oh well there were reason neither of us was named best general. 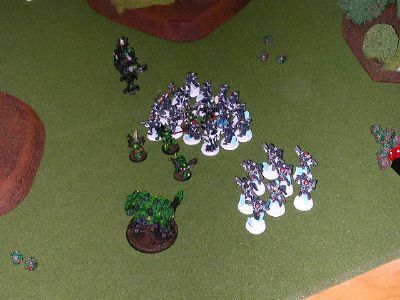 In the end I charged Slim, one green squad, the deamons into his 30 boy grenader squad. I softened them up with a lot of shooting first. So on the fourth and final turn I killed them all and those victory points coupled with only one of my squads being wiped out lead to a strong victory. If only I had done better in my early fights... I was seriously sleep deprived. If I'd used my pretournament time to do even more painting. Maybe somehow took a display on the plane... Next time I hope to do better and I don't even know my final score yet!